I adored this novel. I knew very little about it going in, but the cover grabbed my attention at B&N and after reading the opening pages, I was hooked. The story follows Finley, who lives and breaths basketball. So does his girlfriend, Erin. They both live in a bad neighborhood, ruled by the Irish mob, drugs, crime, and severe racial tension, but the two find an outlet in ball. They train together. They even break up each basketball season to better focus on their game. Then Russ moves to town after the tragic murder of his parents. 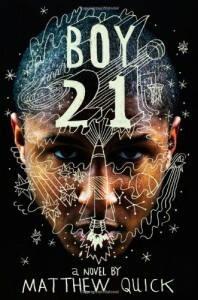 A prodigy and highly-recruited ball player, Russ has been shattered by the loss of his parents. He will no longer touch a basketball and answers only to Boy 21, the number of the jersey he used to wear. Finley’s coach asks Finley to reach out to Russ. While the two boys’ lives are initially forced together, they both find a surprising friend in the other. There is so much to love about this novel, especially the friendship aspect. I want to read more novels about friendship. And what sparks between Russ and Finley is no easy relationship, because as Russ heals from his loses, he begins to touch the basketball again, threatening to take Finley’s starting position. Finley’s relationship with Erin sees similar levels of growth. By the end of this novel I was crying like a baby. This is a moving story about trust, hope, and the power of friendship. And if you’re like me and have a love of lay-ups, jump-balls, and triple doubles, the basketball aspects of this novel will be icing on the cake.